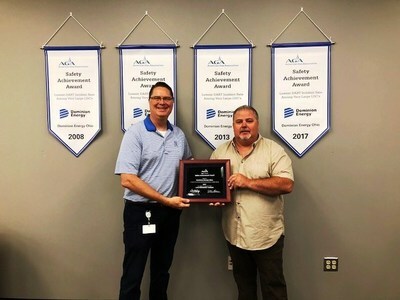 CLEVELAND, Aug. 30, 2018 /PRNewswire/ -- For the fourth time in the past decade, Dominion Energy Ohio has received the American Gas Association (AGA) Safety Achievement Award for excellence in employee safety. The award recognized Dominion Energy Ohio's 2017 employee safety performance. The award is natural gas utility industry trade group's highest employer safety honor. The company also won it in 2008, 2011 and 2013. The AGA awards its Safety Achievement Award to member companies that experience the lowest incident rate for the number of days away from work, restricted or transferred (DART). Dominion Energy Ohio and its 1,700 employees recorded only six such incidents in 2017. Jim Eck, Dominion Energy vice president and general manager, Ohio & West Virginia Distribution, described the accomplishment as the industrial safety equivalent of a professional sports team winning championships in multiple years. "Working together on numerous safety initiatives with the members and leadership of Gas Workers Union Local G-555, Dominion Energy Ohio has worked hard to live up to our first and most-important core value, safety." Eck said. To mark the accomplishment, company and union leaders unveiled four championship banners, similar to the Cleveland Cavaliers' National Basketball Association banner that hangs from the rafters of Quicken Loans Arena. "Our employees' commitments to their personal safety, the safety of their teammates and excellent customer service, have earned this recognition for our company," Eck added. "It is great to be recognized by the AGA," Eck says. "This affirms what we already recognize. Our collective diligence, in making sure all our colleagues work and return home safely every day, is core to our culture."